We are now mere hours away from the long-awaited (there’s an understatement) first ever 3D entries in the main Pokemon video game series, Pokemon X and Pokemon Y. To celebrate and, quite honestly, to kill some time while enduring the wait, I decided to have a look back at some of my favourite memories the series has given me in-game. I use the term “in-game” to mean anything taking place during the game’s story (that is, anything before and possibly immediately after the Elite Four), as opposed to, say, any awesome competitive battles I have had the pleasure of participating in using EV trained, IV bred fighting machines. Nearly every Pokemon release has been an inherently multiplayer experience for me, because in my book that’s the way it was designed to be played. There is a tradition among my close friends and family who play Pokemon that whenever a new game comes out, we try to get together and play the first few hours alongside one another, battling after the first gym and sometimes after the second as well. As a result I try to catch and train Pokemon that my fellow players aren’t likely to pay attention to, just to make the battles more interesting. Never has this been more true than at the start of the fifth generation of Pokemon, when I caught a super-common Patrat and trained it to the mid-teens solely because its movepool seemed deliberately stacked with the most annoying moves possible. Detect, Sand-Attack, Bite, Hypnosis… I mean, really, how could I not? 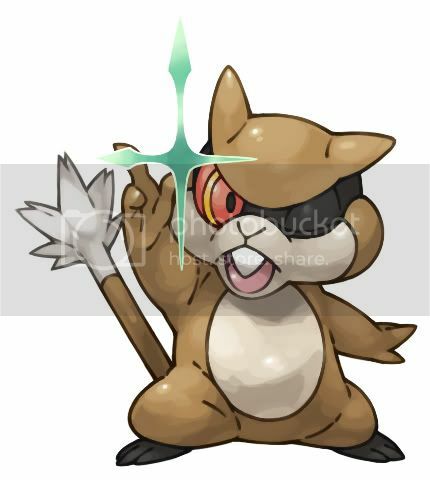 In our first battle Patrat was my highest-level Pokemon and I used its full irritating potential against my brother, only to dump it in a box forever afterwards. If not for that tradition, I wouldn’t have looked twice at the caffeinated chipmunk for my in-game team.